A 30-day project has turned into a 3-month project, but well worth the wait! If you recall from my first post about limoncello, Ryan and I really wanted a more authentic version of limoncello to remind us of our wedding day! After the first try, I changed several things about the recipe for my second post. Now, I think I have finally perfected the blend just in time for Father's Day! Straight from the freezer with a sprig of mint from my garden! Start with a very large container or glass bottle. When you add the simple syrup, it increases in volume! Use the strongest vodka you can find (recommend 100 proof). If lower, the limoncello will actually solidify in the freezer! Don't add the simple syrup all at once. 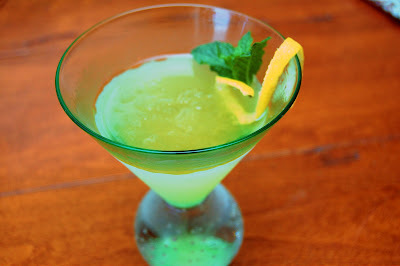 I prefer a less sweet limoncello, so I don't use all the simple syrup in my own recipe. Aren't you impressed with my Italian?!?! Salute!! First, thoroughly wash and scrub any residue and waxes from your citrus. Zest the lemons. You’ll want to zest just to the white pith, but no further. If you do zest any pith, it will taste bitter. 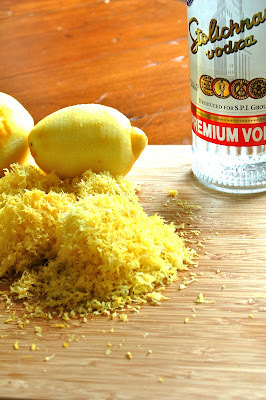 Add the lemon zest to a very large airtight glass container (I use a mason jar while the liqueur sits, but then transfer to a nice bottle for drinking). Pour in the vodka, seal tightly, and let sit for at least one week, preferably longer! (Ideally, give it one to two months.) I usually put this in the back of my pantry...out of site, out of mind! 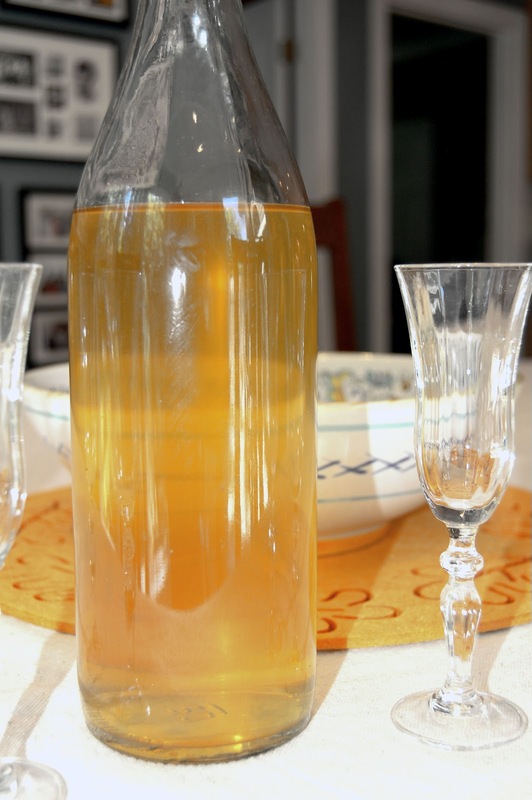 After you've let your limoncello cure for your preferred length of time, prepare the simple syrup. To make the simple syrup, simmer the water and the sugar over a low heat just long enough to dissolve the sugar. Do not bring to a boil. Remove from heat, and cool to room temperature. When cool, add the simple syrup a few tablespoons at a time into the limoncello, tasting as you go. Allow it to rest for another 10-14 days. Finally, strain the limoncello using cheesecloth or a coffee filter. With the zest, you should do this 2-3 times to make sure all the sediment is removed. Place the container or bottle in the freezer and served chilled.